I've been home in Silver Spring for a week now, most of which has been spent Christmas shopping and doing a lot of driving. While I expected a lot of car traffic, I've been pleasantly surprised to see bicyclists everywhere I go, even on big, fast suburban highways. I've biked regularly for a year and a half now, happily pedaling around Philadelphia and the District, but I haven't enjoyed my forays outside the city. 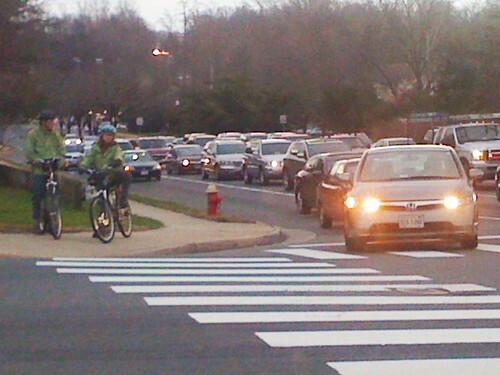 Arlington, for all of its bike lanes, is quite hilly and has some really confusing intersections. The Capital Crescent Trail in Bethesda is pretty, but frequented by super-serious, capital-B Bicyclists who thought nothing of shoving me or my 12-year-old brother out of their way when we biked it last summer. Nor have I had a pleasant time biking in downtown Silver Spring, where the bike network is so lacking that a route on Cedar Street was once declared the "Stupidest Bike Lane in America." A couple in matching coats tries to cross Route 50 at Pickett Road in Fairfax City. It took me three light cycles to make a left turn here, but they had to wait much longer for a right-turning driver who'd stop for them. A bicyclist waits between trucks and SUVs to cross Route 175 at Dobbin Road in Columbia, a massive intersection bordered by the even bigger Columbia Crossing shopping center. This is probably the most inconvenient bicycling environment you could create: fast roads, no sidewalks, and nearly every building is on a hill and facing away from the street, making each trip a long, time-consuming and tiresome trek. 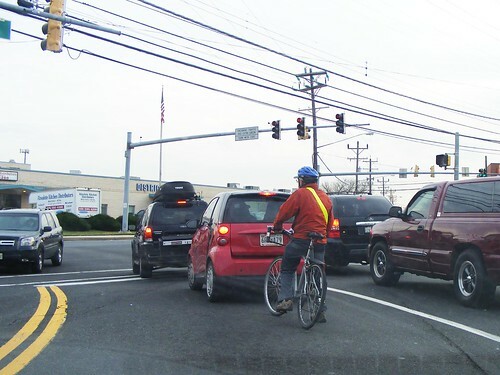 I found this bicyclist at the intersection of Rhode Island Avenue and Route 1 in Beltsville. Unlike the last two examples, the streets here aren't that large. But since it's a mile north of the Beltway, this intersection can get very congested, making it a difficult place to bike. Rhode Island Avenue also doesn't have sidewalks for much of its length, meaning bicyclists don't have a choice but to "share the road." When the District can't build its planned bike lanes, it's hard to believe that surrounding suburban communities will do much better. While I'm excited that Montgomery County, Alexandria, College Park and even Columbia are trying to join Capital Bikeshare are start bikesharing programs of their own, they're not always hospitable places to ride a bike, which will discourage people from using them. Despite unsympathetic drivers, spread-out communities and a lack of infrastructure, there are a few people in the D.C. suburbs who get around by bike. 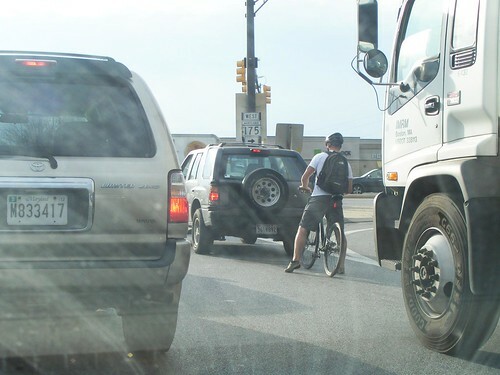 If we want to get anyone else on two wheels, however, we need to make the suburban bicycling experience safer and a lot more enjoyable. This is a chicken-egg problem; we need to improve facilities to increase the number of cyclists, but we need to increase the number of cyclists to justify investments in better bike infrastructure. 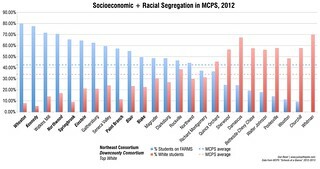 I think we have to take the plunge with bike sharing in the densest, most urbanized areas of the county (DTSS and the Bethesda CBD are the best candidates) and start building better connections within and between these areas. It is amazing to see how many people use the Capital Crescent Trail for commuting, and building on this facility and the destinations it ties together seems to me to be a promising strategy. Finishing the Metropolitan Branch Trail between the SS metro and the DC line would be a huge step in the right direction. Impressed by the cyclists in your photos, cycling in quite adverse conditions.